There were many memorable sights on that day but the one that stuck in many people's minds was the sight of the cranes which were lowered to half mast as the cortege sailed down the river. It was Bermondsey's own tribute. 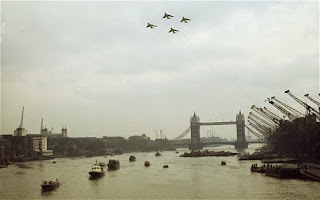 Today the Havengore, which had carried the coffin 50 years ago, sailed down the Thames again, with Tower Bridge opened to fullest extent in salute, as crowds lined the river banks. As a small boy of 5 I don't remember much of the event but I do remember watching the train that carried Churchill's body from the window of my Nan's flat, overlooking the railway lines going into Clapham Junction. I don't think I knew exactly who Churchill was but the picture of that train carrying the body of a very important man has lodged itself in my memory until this day. The Friends of St James Churchyard had its official launch tonight in St James's Church. Drawing together members of the local community, the church, and the Council, and following the example of the Friends of Southwark Park, the group has the goal of promoting the good management, maintenance and development of the churchyard. Tonight we heard of the Parks Department's plans for new planting on the eastern edge of the churchyard (near 'The Greg'), new wildflower meadows on the south side, and the regeneration of the pond, currently underway with the help of conservation volunteers. Issues were raised including the Garden of Remembrance, the perennial issue of dog poo, the painting of the gates, the repair of monuments, lighting and the distant prospect of the return of the much missed Bermondsey Joy Slide (below). In short the Friends have got off to a good start. Coming soon: they are going to: have a tour of the church building, including the hidden areas not usually open to the public; launch a photographic competition; and run a stall at the summer fair. 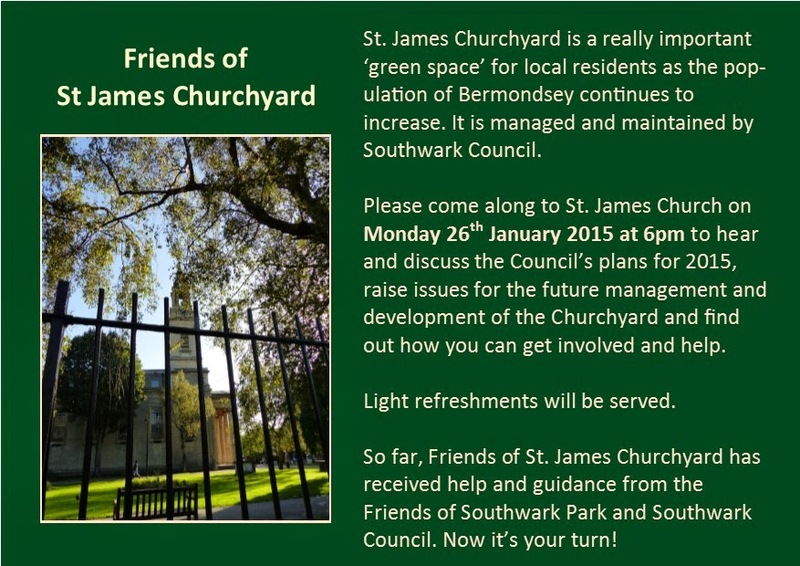 In the meantime if you have any ideas about the churchyard, or would like to join the Friends, let us know! Our new Bermondsey Christian Training course, Fruitfulness on the Frontline, got off to a great start this week. The frontline is wherever you are during the week, doing whatever you do. Jesus said 'My Father is glorified by this, that you bear much fruit' and the great news for every follower of Jesus is that they can be fruitful for him in their everyday life, whatever they are doing. Week one of the course introduced the 6Ms which will be the theme of the course: modelling Godly character, making good work, ministering grace and love, moulding culture, being a mouthpiece for truth and justice, and a messenger of the Gospel. It's not so much a list of things to do, but a way of life. The 6Ms will be unpacked, one by one, during the rest of the course, but in the meantime, the prayer card (above) is a reminder for course members and a stimulus for prayer. 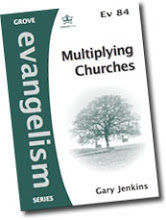 The course continues at St James next Wednesday at 7.30pm and its not too late to join. Just turn up. The sessions last for about an hour and a quarter and include videos, discussion, and a short bible talk. St James School, Old Jamaica Rd building, was the venue this afternoon for a meeting of parishes from the Woolwich Episcopal Area (roughly the boroughs of Greenwich, Lewisham, & Southwark) about Mission Action Plans. Bishop Michael led the event - and we had been asked to host it. Several parishes shared their plans and everyone had the opportunity to talk about their parish experience of drawing up a MAP - a kind of plan of action for the parish, which every parish in the diocese has been asked to draw up and present to the bishop. 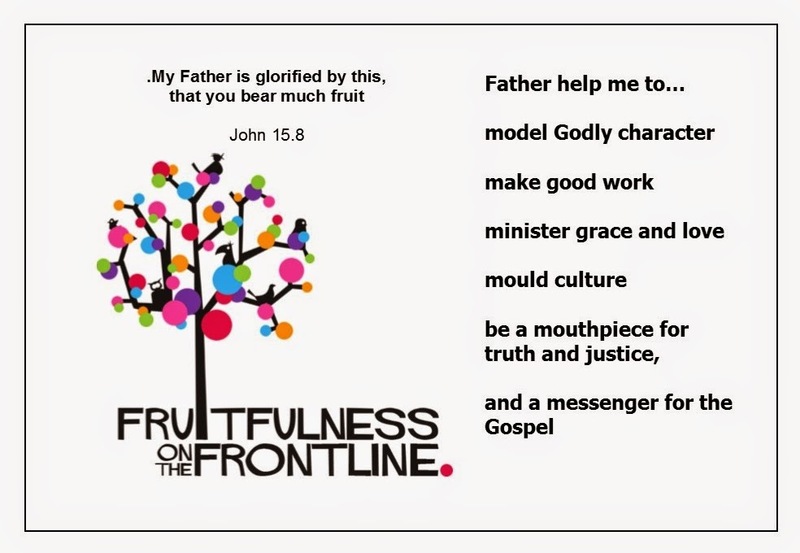 Fruitfulness on the Frontline (see video) a new DVD-based course from the London Institute of Contemporary Christianity is the exciting next part of our Bermondsey Christian Training programme, starting this Wednesday at St James, at 7.30pm. Come and find out how you can be fruitful on the frontline, wherever the frontline is for you. Everyone welcome. The Friends of Southwark Park led the way, but now with the help and encouragement of Councillor Anood Al-Samerai, St James's Churchyard has its own Friends group, drawing together representatives from the church, the council and local community. 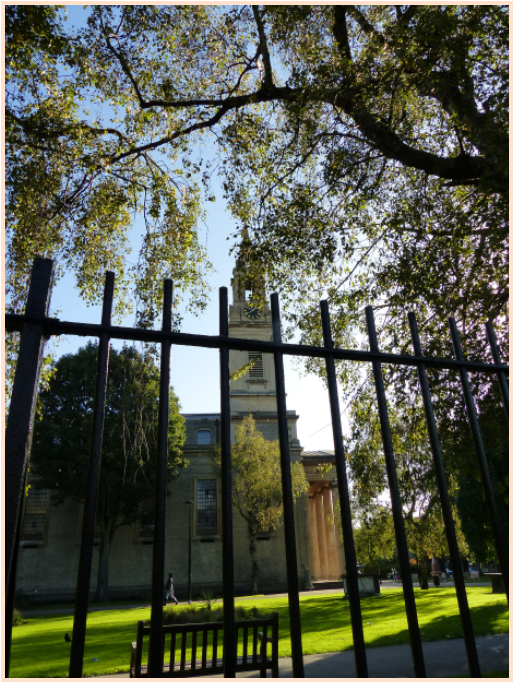 A beautiful green oasis in the heart of Bermondsey, the Churchyard is managed and maintained by Southwark Council as an open space for the enjoyment of all. The new Friends Group has its official launch on Monday 26th January in the church at 6pm. The Council's park's department will be presenting plans for Spring and Summer planting in the churchyard, details of future Friends events (including a planned photography competition) will be shared, and there will be the opportunity for members of the local community to make their views known. Do come and do spread the word. According to the Evening Standard the population of London will hit an all time high next month, exceeding the prevous record level of 8,615,000 in 1939. 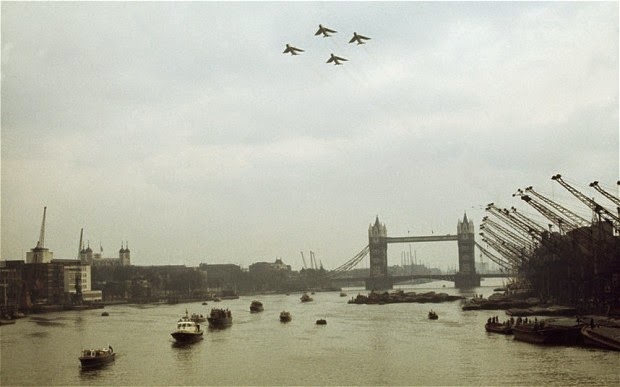 After the war the population of London started to fall, and by the early 80s it had reached a low of 6.2m, with the reduction in population being most marked in the inner London boroughs. In those days I was a school teacher with the Inner London Education Authority and schools were being closed all over inner London because of falling school rolls. Since then the city has attracted two million new residents and the population is set to reach the 10 million mark by 2030. Here in Bermondsey the population is booming. 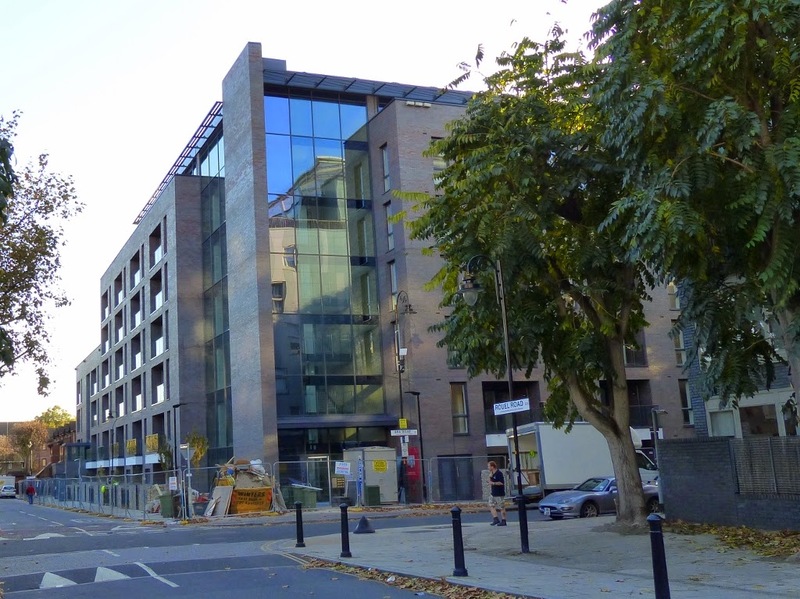 The Bermondsey Spa development is now complete, with residents starting to move into the last part of it, the Porter Building (right) on Spa Rd just before Christmas. Meanwhile developments continue apace at Chambers Wharf, in Old Jamaica Rd, and Drummond Rd, and more are planned for the biscuit factory site - and that's just in Bermondsey, that's to say nothing about the huge developments planned at Canada Water or at the Elephant. 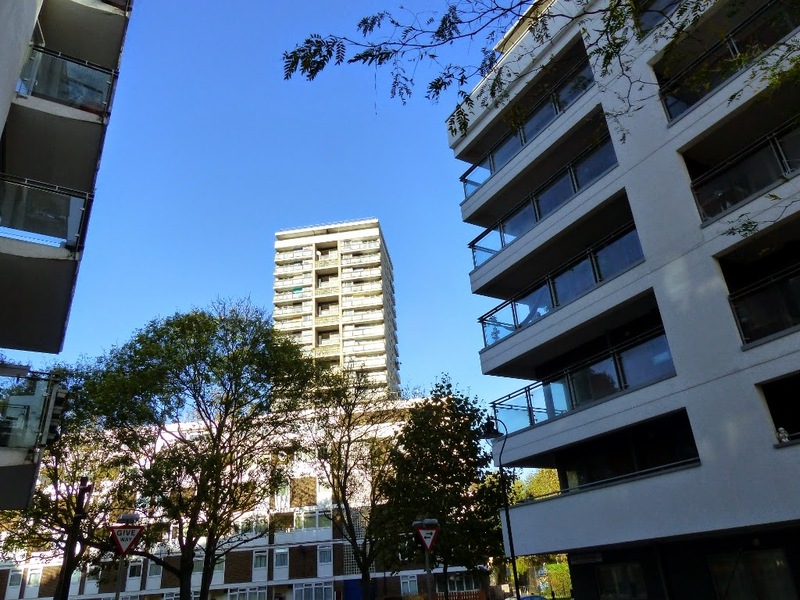 The challenge is to develop the infrastructure at the same rate at the population grows (there is a particular challenge about school provision) and to maintain a good proportion of social housing and affordable homes in new developments at a time when property prices are rocketing. But overall its good news. Here is the view of tonight's fireworks from the roof garden of the Salmon Youth Centre, venue of tonight's excellent church New Year's Eve Party.